Just Say Yes Events: Celebrity Wedding. "From the matching Tom Ford bowties to the unity sand ceremony to the 10-ft. ice sculpture bar, the wedding of American Idol's Jim Verraros to entrepreneur Bill Brennan on Sunday was planned down to the last detail." Just Say Yes Events had the privilege of being the “Day Of” planner for Jim Verraros from American Idol and Bill Brennan President of Bridal Expo. Every detail of this wedding was hand picked and reflected both Bill and Jim’s personal style and taste. The location chosen was the luxurious Oak Book Hills Resort which was a reflection of Bill’s green thumb as he is an avid gardener. The ceremony took place within the lush gardens with a view of the water and elements of greens, floral and my favorite part, a sand ceremony. 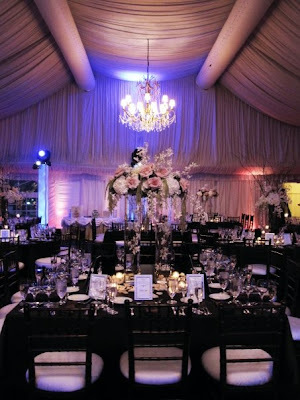 The reception was held in the Marquis tent of the resort that was perfect for their Old Hollywood theme. Every last detail was thought of from the favor silver frames with a secret photo of the couple hidden inside to the huge ice sculpture bar inspired by the lions that have been in front of Chicago’s Art Institute, since 1893. Just Say Yes Events strives to make every event, in any budget, spectacular and most importantly run smoothly. Bill and Jim are very dear to us and we feel extremely privileged to have been part of their special day. Congratulations from the entire Just Say Yes Events team!